Download the completed example template project. If needed, also download some sample movies. Building off the previous introduction tutorial on setting up VDMX to trigger movies like a DMX media server, here we will use a simple template for turning a Mac into a DMX controlled two channel video mixer for crossfading between two video sources with some additional playback controls such as volume level and contrast/saturation adjustment. This basic setup can be easily built on with more layers and parameters to create custom rigs for VJing, media servers, theater visuals, and video installations to fit the specific requirements of projects where DMX control is needed. Example DMX controlled two channel mixer template with sample movies. 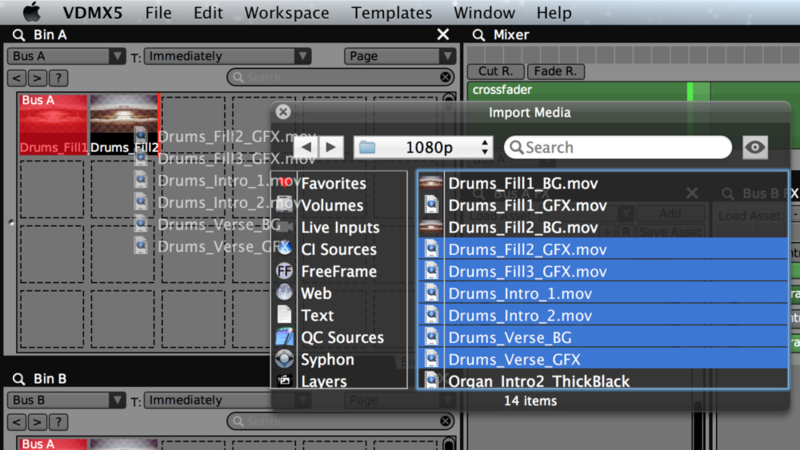 Step 1: Open the 'Two Channel DMX Mixer' example project and load your movies into VDMX. Drag files from the Finder or the media browser window. Use built-in generator media such as 'Color Bars' and 'Constant Color' as test patterns. Clips are triggered by their page index using DMX values received for Bus A (channel 4) and Bus B (channel 18). No movies of your own? Download some samples from here or here. Loading movies using the built in file browser. 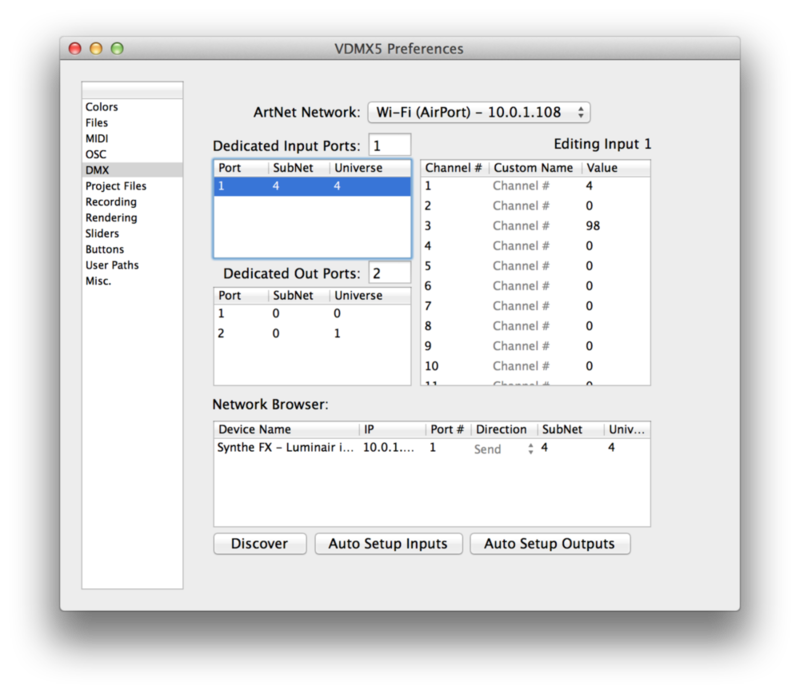 Step 2: If needed, setup DMX receiving options in the VDMX Preferences. The included template is set to receive incoming DMX on Port 1. Click the 'Auto Setup Inputs' button to set the SubNet and Universe addresses of the input ports to match any sending detected ArtNet nodes on the network. Step 3: Send DMX over ArtNet to trigger movies and adjust playback settings. See the Read Me included with the example project for complete channel mapping. Additional DMX mappings can be made using the UI inspector or the DMX hardware detect option. DMX Preferences, receiving on ArtNet SubNet 4, Universe 4 from the Luminair iOS app over a WiFi connection.